Not sure what you could do with it but its really interesting. Saw it on Zero Hedge and I decided to check it on stockcharts. Edited by fib_1618, 23 January 2019 - 07:24 AM. Not enough touches on the trendline. Long-run average return is 7 percent. If you use the 1973 bull market high, you get 2735.82 now. If you use the 1974 bear market low, you get 1196.16 and it was very close to picking the 2009 bear market low. Odds for a major bear market low are at for a much higher low since bear markets usually correct 50 to 62 percent of the previous bull market. 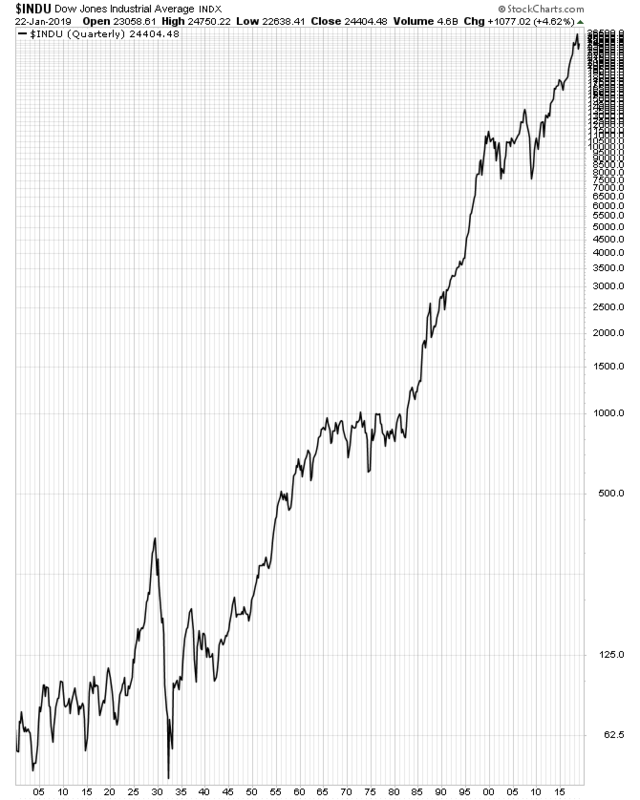 2009 was an exception, unless you view it in context of correcting the 1990's bull market a second time. Edited by Data, 23 January 2019 - 11:18 AM. Those charts area bit silly, as they compare apples to oranges...I mean seriously, you're going to compare a 1900 dollar to one today? Even then, though, we are still way up there. Interest rate and debt are different. No, they're not....it's all relative to the present not to the past.